Our research-based School Transformation Framework creates a measurable impact for the children we serve and builds capacity in the teachers and leaders we partner with each year. Our staff are highly effective teachers and leaders, whom we have trained to act as Results-Oriented Change Agents – providing on-the-ground thought partnership, coaching and technical support in schools 3.5 days per week. 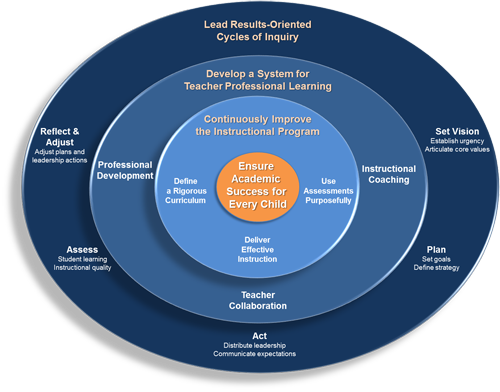 RESULTS-ORIENTED LEADERS: We partner with principals and their leadership teams to analyze data, set SMART goals, develop a thoughtful plan of action,, and engage in ongoing cycles of monitoring and adjustment. CULTURALLY RESPONSIVE TEACHERS: We support teachers to implement new strategies in their classrooms by ensuring each of our intensive schools implements a thoughtful professional learning plan that supports teachers to learn new content, collaborate with their peers and receive individualized support and feedback. What Partners has done is, they have built the capacity of my teachers to make sure they’re more effective in what they do in the classroom.